This hallmark product of National Cycle (our legendary original designs patented in the 1940s) has been painstakingly refined for today's cruiser motorcycles. 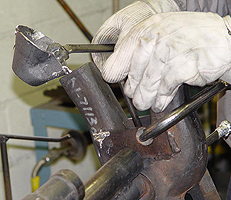 With our old-world casting methods, the shape and details that distinguish our Fender Tips really stand out. You may also like our cast Speedometer Cowls. They not only add some stylish chrome to your bike, but they prevent instrument glare on your windshield when riding at night. Create the perfect fender treatment for your Harley-Davidson® motorcycle! National Cycle Cast Fender Tips are an economical way to add that finishing touch to your customized bike. 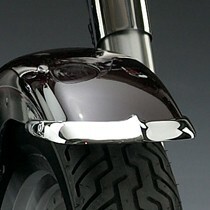 National Cycle's Fender Tips are custom designed and clay modeled directly on the bike. They are sized for each model's front and rear fenders, so sizes will vary. Our half-moon style Speedometer Cowls are also a perfect fit for your traditional tank console speedometer. It will be hard to find accessories like these that will add so much to your bike at such a reasonable cost. Back in the 1940s, National Cycle patented the classic "airstreamer" style fender tip that practically defined the American cruiser look. This hallmark product has been painstakingly refined and updated for today's motorcycles. By casting the product, the shape and high crown details that distinguish these tips really stand out. These are not ordinary fender tips! Our cast tips have a jewel-quality chrome finish with a show bike polish. 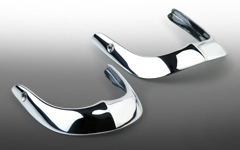 Like all our products, National Cycle Cast Fender Tips are Made in U.S.A.
National Cycle Fender Tips and Speedometer Cowls are carefully hand cast from zinc alloy, meticulously hand polished, and then chrome plated. Fender Tips are mounted with countersunk outside screws or concealed screw mounts, which will vary depending on application. Hardware is determined by best styling and fit. Our Speedometer Cowls install easily with 3M® adhesive tape. These products fit a wide range of models, and new applications are always in development. Click the SHOP menu for fitment information for your motorcycle.